This page focuses on how to read the tsunami.gov map page. Answers to other tsunami questions are on the Tsunami Frequently Asked Questions page. What does the banner at the top of the page show? The information in the banner corresponds to the message that communicates the greatest estimated danger posed by a currently active event in any of the regions covered by the U.S. Tsunami Warning Centers. If there is not currently an active event, the banner provides basic earthquake information about the last earthquake that prompted a message to be issued by either center. Banner colors are associated with message type (alerts and threat) as shown below. There may be other important messages associated with an active event. See the next questions to learn more. Where can I see all of the tsunami messages for an event? For the United States, Canada, and the British Virgin Islands, all the active tsunami alerts associated with an event are listed below the map. You may need to scroll down to see them. Alert icons precede text that states where the alerts are in effect and the time and date of issuance (default browser time). The Previous 40 Tsunami Messages table beneath the list of active alerts contains the last 40 tsunami messages issued by the U.S. Tsunami Warning Centers, including tsunami threat messages for international partners. What is in the Previous 40 Tsunami Messages table? This table contains basic information associated with a message issued by a U.S. Tsunami Warning Center and provides links to more detailed information. Basic information includes message issue time (Coordinated Universal Time—UTC, links to a message-specific page ), origin time (UTC), magnitude, depth, latitude and longitude,source location, and message type (links to message). The table is sortable by column, but the default is to sort the table with the most recently issued message at the top. Obs/Forecasts: The Observations and Forecasts link goes to a page that includes information about the event, including source location, magnitude, depth, origin time, and message issue time (default browser time). Observations (observed time and height) and forecasts (predicted height and arrival times) are provided in the table when available (observation and forecast times are UTC). TEX File: The TEX (Tsunami Event XML) file is intended for those who need to automate tsunami information dissemination. CAP File: The CAP (Common Alerting Protocol) file provides information on the tsunami message in a format intended for use by those involved with emergency message transmission. The CAP message is provided in version 1.2. English Message #: This message is the English version. It is also available in the Messages column . It may not be the most recent message issued for a region. Spanish Message #: This message is the Spanish version. It may not be the most recent message issued for a region. Spanish versions are not available for all regions. 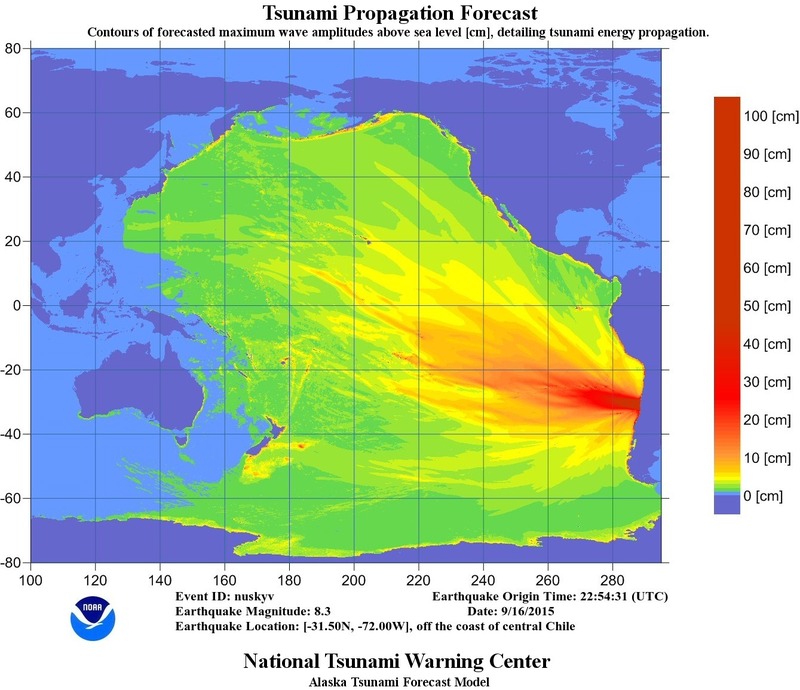 Energy Map: When a forecast is available, an Energy Map shows the maximum tsunami forecast heights throughout the ocean basin and provides information on general directivity of the tsunami energy. See example below. Travel Time Map: When a tsunami is expected, the Travel Time Map shows expected travel time (in hours) from the tsunami’s source to locations throughout the ocean basin, when available. Contours on the map represent 30-minute intervals. Each change in color shade of a contour line is a one-hour mark. See example below. Can I quickly zoom in on the map to a particular region? Yes. The default map is a wide view of the world to show at a quick glance the coastal areas serviced by the U.S. Tsunami Warning Centers. To zoom in to a particular region, select the region in the upper right hand corner of the map. Options are Alaska, Hawaii, Guam/CNMI, American Samoa, Caribbean, North America, and South America. Your browser will consider the last region you select as your default region. To zoom in further or zoom out, use the + and – signs in the lower right hand corner of the map. What is on the Alerts/Threats layer? The Alerts/Threats layer is automatically selected and provides information about currently active messages. If an actionable alert (warning, advisory, watch) is issued for the United States or Canada, the coastlines under alert are highlighted in the corresponding color. For continental U.S. and Canadian coasts, the alert boundaries are also marked with similarly colored pin icons. Zoom in on the map to get a better view of the areas under alert. For U.S. coasts, these “forecast zones” are defined by NWS marine and/or public zones as depicted in the Public Forecast Zone Maps. Entire forecast zones are colored rather than expected inundation zones. Forecast zones extend well-inland from the expected inundation zone. This means that some inland areas may appear to be included in an alert, but that does NOT mean that local authorities are suggesting evacuation from those areas. If in doubt, check with your local emergency management or law enforcement agency (not 911), or NWS Weather Forecast Office. If a tsunami threat is issued for international partners in the Pacific and Caribbean, each country under the threat will be marked with a purple pin icon. National authorities will determine the appropriate level of alert for each country and may issue additional or more refined information and instructions. Mouse over the icons on the map for more information. What do the various messages mean? Tsunami messages are defined on the Tsunami Message Definitions page. What is on the Earthquakes layer? The Earthquakes layer is automatically selected and provides information about recent earthquakes for which a message(s) has been issued. If an earthquake occurs that meets certain criteria (Atlantic, Pacific), its location is shown with an earthquake icon. 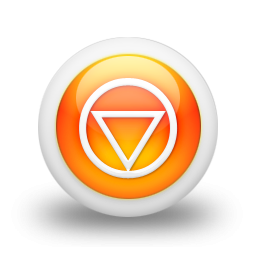 The icon color corresponds with the type of alert/threat (or the greatest level of alert associated with an event). If there are no active messages, the Earthquakes layer provides information about the most recent events of each product type issued in each basin for the last 10 days. Mouse over the earthquake icons on the map for more information and links to the most recent messages. To learn even more about a particular earthquake, visit the U.S. Geological Survey’s website. What is on the Previous 40 Messages layer? The Previous 40 Messages layer uses the icon shown below to display the earthquakes associated with the 40 most recent messages issued by one of the U.S. Tsunami Warning Centers. Mouse over the icon for more information about the earthquake’s location and magnitude and links to associated messages. There may be more than one icon for an earthquake if characteristics like magnitude or location change or if messages are issued by both warning centers. You may need to zoom in to see all the icons specific to one particular earthquake. What is on the Observations layer? If a tsunami is observed on water-level gauges (DART systems and coastal water-level stations), icons on the Observations layer show the locations of the observations. Mouse over the icons for information about each observation. Information includes location, maximum observed height, and time and date of observation (default browser time). For more comprehensive observations information, select the Obs/Forecasts link in the Additional Resources column of the Previous 40 Tsunami Messages table below the map. What is on the Forecasts layer? When the U.S. Tsunami Warning Centers issue forecasts for U.S. coasts, Canada, and the British Virgin Islands, icons on the Forecasts layer show where forecasts are available. Mouse over the icons for information about each location’s forecast. Information includes location, forecasted arrival date and time (default browser time), and forecasted wave height, if available. For more comprehensive forecast information, select the Obs/Forecasts link in the Additional Resources column of the Previous 40 Tsunami Messages table below the map. What is on the Water-Level Stations layer? The Water-Level Stations layer includes icons for coastal water-level stations around the world (not just those associated with a particular event). Mouse over the icons for information about each coastal water-level station’s location and, for U.S. stations, links to water-level data. To learn more about coastal water-level stations, see the Tsunami Frequently Asked Questions page. What is on the DART Systems layer? 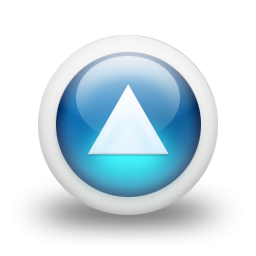 The DART Systems layer includes icons for many of the available Deep-ocean Assessment and Reporting of Tsunami (DART) systems worldwide. Mouse over the icons for information about each DART system’s location and links to water-level data, when available. To learn more about DART systems, see the Tsunami Frequently Asked Questions page. What is on the Travel Time layer? 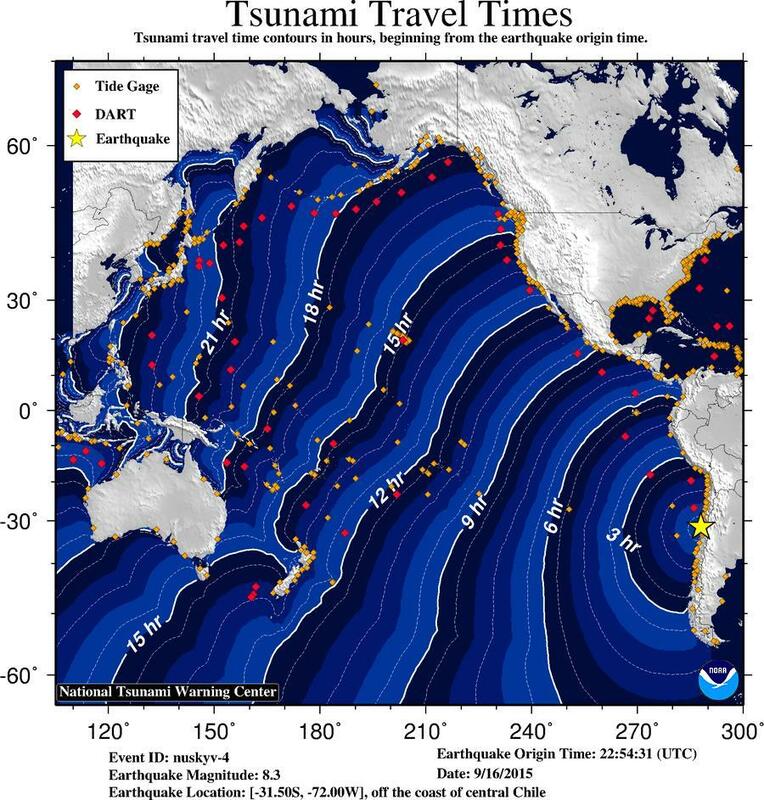 In major events, a tsunami Travel Time layer may be available that displays travel time contours in one-hour increments for the entire basin involved. Why am I unable to select some of the layers? Most earthquakes do not generate tsunamis, thus the Observations, Forecasts, and Travel Time layers may not be populated with information. In these instances, you are not able to select these layers. When a tsunami is occurring, these layers are activated as soon as information becomes available. How can I get information about previous messages that are no longer displayed on the home page? The Previous Tsunami Messages page provides access to a searchable database of previous messages. A search results in a page with a map and a table of previous messages that meet the search parameters. Associated earthquakes are shown on the map with the icon below. There may be more than one icon for an earthquake if characteristics like magnitude or location change or if messages are issued by both warning centers. You may need to zoom in to see all the icons specific to one particular earthquake. The table is sortable by column.